Central Montana is Ranchland. Expansive rolling prairies and small mountain ranges make the Ranchland one of Montana’s most scenic regions. Herding cattle is a way of life for many folks who live in this area of the state. In 1999, the Montana Department of Agriculture counted 498,000 head of cattle and calves in central Montana. Visitors experience the true flavor of the Old West. Many ranches are found on the plains east of Helena. And special mountain ranches are found west of Helena along State Highway 141, the north-south road connecting U.S. Highway 12 and State Highway 200. Here in the Avon Valley, bordered on the east and west by the Garnet Mountains, you can experience thousands of cattle grazing in a lush high mountain environment. Nature is at its best in central Montana. During the summer, thousands of cliff swallows build their nests, made of mud and grass, on rocky outcrops along U.S. Highway 12 between Roundup and Harlowton. Angus cattle graze on summer pasture in mountainous areas in Montana. Photo courtesy Montana Stockgrowers Association. Red fox and other small mammals make their home in the grassy areas bordering the Musselshell River and on the nearby, sagebrush-covered prairies. Abundant whitetail deer and mule deer thrive on natural foods and ranchers’ crops. By night, millions of stars, not dimmed by city lights, shine brightly in the big sky over Ranchland. U.S. Highway 12 is the major east-west road in this region. For travelers headed west, the highway leaves the Yellowstone River Valley and I-94 at Forsyth. The highway passes through quaint small towns as it winds westward toward Helena, Montana’s state capital. Helena, Montana (pop. 31,169) is the the crown jewel of Montana, some might even say the entire Northwest. An early day gold mining town, it’s now the state capital and a major tourist center. The main part of town lies at the foot of the mountains and overlooks the beautiful Helena Valley. The entire Helena Valley is rimmed by mountains on all sides. Montana state capitol building in Helena. Helena is brimming with sights and places to go. The main landmark in the city is St. Helena Cathedral. The Cathedral is a magnificent building by any standard and without doubt an inspiring place to go for worship. The Montana State Capitol is another one of Helena’s architectural treasures. The top attraction in Helena, Montana is the Montana Historical Society Museum, located across the street from the State Capitol building. Hundreds of exhibits tell the story early Indians, trappers, miners, and homesteaders. A special gallery contains numerous original paintings of western art by C.M. Russell, Montana’s most famous artist. If visiting Helena, Montana in late September, don’t miss the Last Chance Community Pow-Wow. Native Americans, many in native dress, celebrate their culture at one of America’s best Pow Wows. The Helena Tourism Business Improvement District publishes a community calendar listing other things going on in Helena. Helena’s Rocky Mountain Ice Arena offers year-round fun for the entire family. This is an classy indoor ice skating rink. Rental skates are available. In Helena, as in most of Montana, the best is in the outdoors. Bordering the city on the south is the famous Mt. Helena. It’s a short hike on foot to the top of Mt. Helena and every bit worth the trip. The view of the Helena Valley and the mountains to the south and west is spectacular. Even in the summer, it’s usually quiet on the top of Mt. Helena, making this a place of solitude and peace. Travel tip: Comfortable shoes are a must for hiking. 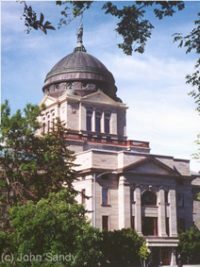 Cathedral of St. Helena in downtown Helena, Montana. The Gates of the Mountains, a few miles northeast of Helena, is another area of uncommon beauty and serenity. The Missouri River flows through an enormous gorge cut deep in the mountains. Boat trips, open to the public, follow the river as it passes though the Gates. Mountain goats are often seen high on the cliffs which border the river. Ancient Indian paintings can be seen high above the river on the walls of the canyon. Another must see in Montana. The Missouri River in this area of Montana is popular with fisherman. Many folks fish the river below Holter Dam, downstream toward the village of Craig. Bird watchers and other naturalists visit Helena in late fall (mid-October to mid-December) to see large numbers of bald eagles at Hauser Lake east of Helena. The eagles, migrating south from Canada, stop at Hauser Lake for several days to feast on kokanee salmon. The kokanee salmon die after spawning, and the eagles take advantage of this plentiful source of food. It’s a great experience to watch a bald eagle, flying high in the sky, drop down rapidly, yet gracefully, to lake level and clutch a dead salmon and then soar away. Many bald eagles rest in the trees bordering the lake, making prolonged viewing easy. Bring binoculars. The Continental Divide is a few miles west of Helena. Along Highway 12 west of Helena is the The Prospector Shop, a place to pick up all kinds of supplies needed for prospecting. Gold mining pans, sold at the Prospector Shop, make nice souvenirs. (406) 442-1872. Lakes formed by dams on the Missouri River near Helena, Montana are popular for boating, fishing, and camping. Canyon Ferry Lake, Hauser Lake, and Holter lake offer some of Montana’s best walleye fishing. Restaurants are plentiful in Helena. An eatery called Coney Island, located downtown on Last Chance Gulch, specializes in tasty gyros and hot dogs. Bert and Ernie’s on Last Chance Gulch is another nice dining place and has a separate Wine Room. For upscale dining, try The Wassweiler Dinner House & Pub. Pan Seared Salmon with creamy goat cheese couscous, tomato, mushroom, sweet corn, spinach, and lemon caper beurre blanc is on the menu at $34. Drive a short distance west of Helena on U.S. Highway 12 to arrive at the Wassweiler. For Italian cuisine and good wine dine at Ristorante Bella Roma on Last Chance Gulch. Service is exceptional here. On Broadway (a restaurant) downtown Helena is another popular dining choice. The Silver Star Steak Company and the Brewhouse Pub & Grille in the Great Northern Town Center, a few blocks north of the downtown area, are also very popular. Old-time Helena residents recommend the Parrot, located on Last Chance Gulch in downtown Helena. The Parrot serves chili, malts, and milk shakes, and sells many kinds of chocolates and caramels. A neat spot if you have a sweet tooth. Try Steve’s Cafe for the best breakfast. Roundup (pop. 1,840) is located on the northern flank of the Bull Mountains. The community is nestled in the hills along the Musselshell River. With its strong ranching heritage still very much evident, Roundup is reminiscent of early-day western towns. If there is an identifiable place where the “Real West” begins, it surely must be Roundup. West of Roundup is the little town of Lavina (pop. 177). Lavina is about a mile or so off U.S. Highway 12. Lavina’s old-style mercantile store, built in 1912, is an interesting architectural treasure in rural Montana. The store is not open for business the last time checked in January 2014. Harlowton (pop. 984) is famous for its annual 4th of July rodeo. Cowboys riding bucking horses and bulls are a regular feature of the all day affair. It’s a highly entertaining event. The setting for the rodeo, with the beautiful Crazy Mountains in the background, is absolutely awesome. Downtown Harlowton, with its old stone hotel, resembles a scene from out of the movie “Shane.” For travelers heading west from Harlowton on U.S. Highway 12, the Bair Family Museum, near the small town of Martinsdale is a special treat. Antelope are a common sight grazing along U.S. Highway 191 north of Harlowton. U.S. Highway 12 west of Harlowton, Montana in early winter 1975. Snow-covered highways can be dangerous, so drive with care. Lewistown (pop. 5,870) is located off U.S. Highway 12, northeast of Harlowton. Lewistown is generally not a destination spot for tourists. It is nonetheless a very nice place to visit. Lewistown has a classic, old-west main street, filled with merchants of all kinds. Many visitors like to go for a ride on the Charlie Russell Chew-Choo, when visiting Lewistown. The Chew-Choo is a 1950s era dinner train that runs over an old Milwaukee Railroad line some 28 miles from Kingston Junction near Lewistown to Denton. The three and one-half hour trip passes thorough scenic Montana landscapes. While on board, passengers dine on chow catered by the Yogo Inn in Lewistown. The train mainly operates from Memorial Day through September, on Saturdays. Fairs are for summer fun in Montana. Lewistown hosts the Central Montana Fair. Live entertainment, rodeo, carnival rides, and hand-crafted exhibits make this a wonderful event for all to attend. In 2019, this event runs July 24-27. The Big Snowy Mountains and Crystal Lake are a major attraction in this area of Montana. It’s worth the drive up a rough dirt road to see Crystal Lake, near the summit of the mountains. The road to Crystal Lake goes south from U.S. Highway 87, a few miles west of Lewistown. Outdoors enthusiasts enjoy Big Spring Creek, a major stream flowing through Lewistown. A walking and jogging trail borders the stream just outside the city. Spring Creek is also a hot spot for rainbow trout fishing. The Lewistown area is a destination for those who want to experience ranching and the cowboy way of life. Visitors ride horses and participate in other ranch activities at Half Moon Ranch Adventures, Rainbows End Ranch (406-538-8820), Russell Country Ridgreriders (406-462-5612), and Wickens Salt Creek Ranch. Montana rancher with his adopted Native American daughter. Montana Mountainmen Antler Art gallery at 313 E. Main is a special place to visit in Lewistown. The owner and artist Frank Hanzel is a delightful fellow. His specialty is antler art. Antlers from deer and elk are carefully crafted into chandeliers, knives, wine holders, and many other beautiful works of art. The gallery also sells many fine limited-edition western prints, bronze sculptures and other works of art. Moccasin Mountain Gallery and Gifts in Lewistown is another must visit merchant. Lots on wonderful stuff here, much crafted by Montanans. The Yogo Inn (800-860-9646) is known for its superior lodging, lounge, and dining. Be sure to book early at this extra nice Montana hotel. Lewistown also has a Super 8 Motel. Local folks often dine at the Empire Cafe or Ruby’s 100% Montana Burgers. For bed & breakfast style lodging, the Symmes/Wicks House on Central Avenue, a beautiful tree-lined street just a skip from Lewistown’s Main Street, is tops. This B&B features four large bedrooms all with private baths. Call 406-538-9068. Travel tip: Savvy tourists, who want to mix in with local cowboys, ask for “whiskey ditch” when making the rounds at watering holes in Lewistown. White Sulphur Springs (pop. 908) is a small, friendly ranching town. The picturesque setting for the town is the beautiful Smith River valley. The valley is surrounded by the Castle, Little Belt, and Big Belt Mountains. The Smith River offers legendary floating experiences. About 30 miles downstream from White Sulphur Springs, the Smith River flows through a magnificent canyon with cliffs over 1,000 feet high bordering the river. Wildlife abound in the Smith River valley. Float trips on the Smith River are so popular that state officials who regulate recreation on the river must limit the number of daily launches. Floaters must get a permit from Montana Fish, Wildlife, and Parks before entering the river. Some visitors use the services of local outfitters in the region who are licensed by the U.S. Forest Service to take people on float trips down the river. FWP ‘s Web site lists addresses of licensed outfitters. Trout fishing is another favorite activity on the Smith River. Guest ranches draw many visitors to this area of Montana. A visit to a guest ranch is a experience long remembered. Make a reservation early. If you like fun and music don’t miss the 9th Red Ants Pants Music Festival coming up July 25 – 28, 2019 in White Sulphur Springs. This is one of Montana’s premier summer events. White Sulphur Springs is a place waiting to be discovered. With no interstate highways nearby, the town is off the beaten path. The entire area is a natural wonderland. In town, Grandma’s Antiques and Collectibles is a popular stop for tourists. Townsend (pop. 1,978) is on U.S. Highway 12 west of White Sulphur Springs. The Broadwater County Museum is the main attraction in Townsend. Its collection features all kinds of neat things related to the settlement and history of the region. A first-class show run by friendly people. Boulder (pop. 1,427) is in the scenic Boulder River Valley about mid-way between Butte and Helena on IH-15. A few miles north of Butte the road passes through a broad intermontane valley. Then the road winds its way through the mountains and follows the upper Boulder River Valley. Wildlife can be seen along the highway during certain times of the day. The Free Enterprise Radon Health Mine draws many visitors to Boulder. Radon is a gas released from the natural decay of uranium found in rocks in this area. People come to the mine to seek relief from various ailments. It’s believed that exposure to radon in the mine offers therapeutic health benefits. Boulder Hot Springs & Spa is a popular destination in Boulder. Geothermal mineral hot springs are the reason people come. Guests stay at bed & breakfast rooms and suites and regular guest rooms. No alcohol or smoking here. Elkhorn State Park is near Boulder. Elkhorn is an old ghost town. It’s a reminder of better days gone by. Abandoned buildings are common and huge heaps of slag rock mark the site of an old mine. The bones of many miners are buried in the high alpine forest close by. Travel tip: US Highway 12 is an older two-lane, east-west highway running across central Montana, so drive carefully and watch for wild animals and loose livestock in the roadway.